W5 is one of Northern Ireland’s favourite visitor attractions, W5 offers a contemporary setting to make your event cutting edge, unique and above all memorable. 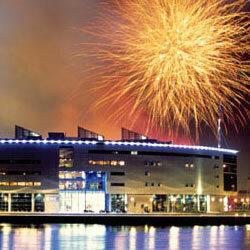 Situated on the banks of the River Lagan, W5 is within easy reach of Belfast’s transport networks and finest hotels. Whether you are planning a board meeting for 16, an exclusive reception for 50 or an awards ceremony for 250, W5 will dazzle your guests. Combining W5’s corporate spaces with successful corporate events demands careful planning and expert execution. And that´s exactly what W5 is known for. Corporate events have become more sophisticated in recent years and W5 is a venue like no other. With its unique design and location W5 offers an eclectic mix of style and functionality for any kind of corporate event. W5 has four seminar rooms and two meeting rooms varying in size. These rooms are ideal for training days, workshops, as interview rooms or for conference breakout sessions. A 500sqm room, located beside the lecture theatre offering a variety of room layouts. With its high ceiling and open area the exhibition space is perfect for dinners, receptions, exhibitions and products launches. he Atrium offers an impressive space for any corporate event. An open, creative area, the atrium is located in the heart of the building and provides wonderful views across Belfast harbour and is ideal for corporate hospitality, especially at night. A superbly laid out lecture theatre, excellently serviced by audio visual aids with a separate AV booth. 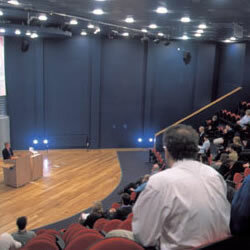 The theatre´s tiered seating for 200 makes this room a very special space which is ideal for presentations, conferences and outside media broadcasts. 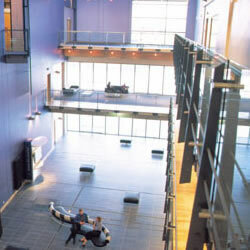 The lecture theatre can be accessed from level 5 or from level 4 when used in combination with the exhibition space. A stunning meeting room with floor to ceiling glass walls that provide superb views of Belfast, which never fails to impress local and visiting guests. Fully air-conditioned, the Point boardroom is ideal for business and breakfast meetings, training seminars, media interviews, outside broadcasts and corporate hospitality. The Point has its own private kitchen facility and hosting area. Parking for up to 1,500 cars, parking fees applicable.